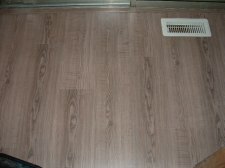 This Moderna laminate review is based on me installing this product. This laminate is manufactured in China by BHK of America. It carries a lifetime warranty. The HDF (high density fiberboard) core material is manufactured with a waterproof glue. This does not make the product water proof but does make it less susceptible to swelling. Moderna also uses the Uniclic locking system which is great for the do it yourselfer or the installer for that matter. Locking systems can make a difference when installing. The product I installed was about 48 inches by 8 inches and was 8mm (5/16 inch) thick. The color is Barn Oak, a gray color. It looked pretty nice. My client ordered this off the internet for 1.59 per foot. The freight was included in this price (providing the order was over $1,000.00) which was great. It did take longer then they said for delivery. But everything was in the order when she received it. 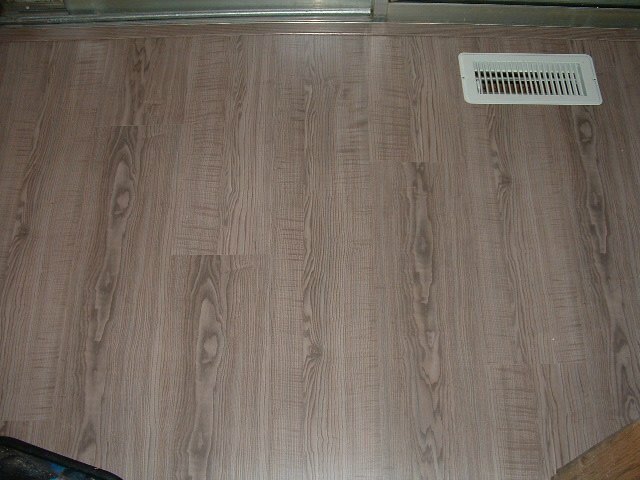 The core material is strong, I didn't encounter any damaged planks during installation. This product allows the planks to be tapped together while laying flat. This is especially handy when installing under door jambs and installing in hallways. The joints were tight when tapped together. Over all I liked working with this flooring. I would recommend this flooring to my readers.